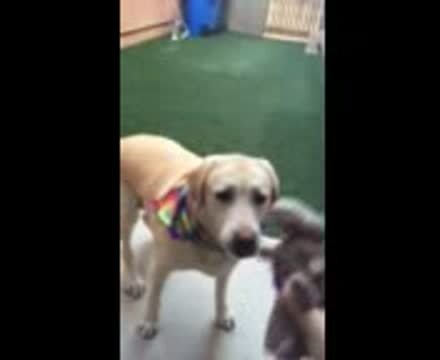 Dakota is a sweet 11 year old spayed female yellow Labrador Retriever that presented for thunderstorm phobia, inflammatory bowel disease, allergies, and osteoarthritis of the elbows. She was on traditional western medications for anxiety, vomiting, itching, and joint pain. Her Chinese diagnosis was Heart Shen disturbance, rebellious Stomach Qi, Damp Heat, and Boney Bi Syndrome. She had deficiencies in Yang, Blood, and Qi, as well as Qi and Blood Stagnation in her elbows causing pain. The goal of acupuncture was to calm her Shen to reduce anxiety, balance her Spleen and sedate her Stomach to resolve the vomiting, dispel Damp Heat to relieve itching, and tonify and move Qi and Blood to relieve the stagnation causing joint pain. GV20, GV14 and HT7 were used to calm her Shen (spirit, mind) and influence Yang. BL20, BL21, ST36 and SP6 were used for her stomach problems and to tonify Blood, Yin and Qi. He-Sea points such as LI11 were used to release Damp Heat and GB31 was used for general itching. BL11, GB34, BL17, LIV3/LI4 were used for the Qi and Blood stagnation that was causing her pain, and local elbow points such as LI10, LI11, TH10, SI8, and Zhou Shu were used to remove obstructions in the channels around the elbows. Dakota no longer has anxiety or vomiting, has markedly reduced itching and has shown improvement in her mobility and overall energy level. Dakota is a wonderful example of the array of issues our geriatric pets can have that are responsive to acupuncture.